I have a sweet giveaway for you from Rebecca’s Soap Delicatessen for one person to win three handmade soaps! Rebecca’s Soap Delicatessen opened in 2001 and makes all handmade soaps using the cold process soapmaking method. They are much better than the commercials soaps that dry out your skin and another big plus is that they last longer too! All her soaps are made from sustainable palm oil harvested in Malaysia. She offers a wide range of soaps that will appeal to everyone including dessert soaps (my personal favourite! ), fragrant soaps, goat milk soaps, all natural soaps, lotions and butters, milk baths, sea salt soap bars, and soaps for dry skin. Rebecca’s Soap Delicatessen is on both Artfire and Etsy. She also has a blog called Rebecca’s Soap Deli News where she will post updates on current giveaways for her soaps and also interviews other artists about their work. I’m a subscriber and always look forward to reading her blog. The Artisan Directory is for artists and crafters with a business. Artisans can add their business along with where they sell online, social network profiles, and more. So if you are an artisan, you should check it out and see what its all about! It looks like a great site and networking is always good for business! 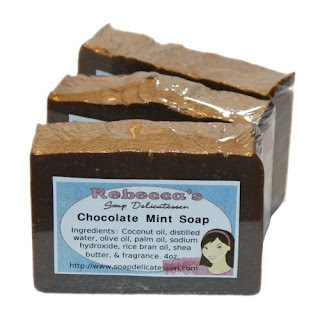 Rebecca’s Soap Delicatessen has generously offered one of my readers three of her Dessert Soaps- Coconut Cream Pie Soap, Hot Apple Pie Soap and Chocolate Mint Soap! Doesn’t that sound delicious and good enough to eat?